Happy New Year! It has been a few months since my last blog post. So many things happened in my life both personally and professionaly last year. I am finally making time for what is important to me and happy to get back to my blog. Last year was a busy year for Liza Jane Interiors and I loved every minute of it. I had my first large commercial job and worked with clients on an AirB&B located on their beautiful horse farm. Needless to say, I was in heaven. Frankly, I am always excited about the new year. The days are getting shorter, Spring is right around the corner, and I am eager to accomplish my goals. I feel upbeat and filled with the possibilities. This year, I have decided to tidy up a few things. I won’t be taking on as many clients as I have in the past, I will be taking my health very seriously and, most importantly, I will be ridding myself, my home and my business of things that do not serve me anymore. 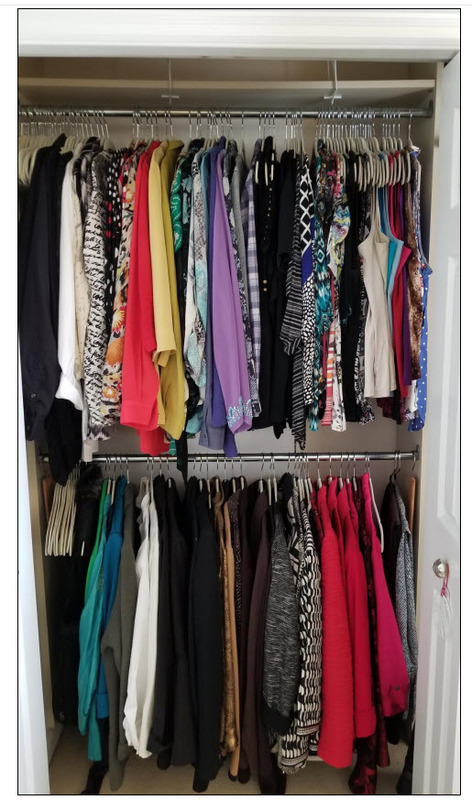 By now, most of you have heard of Marie Kondo. 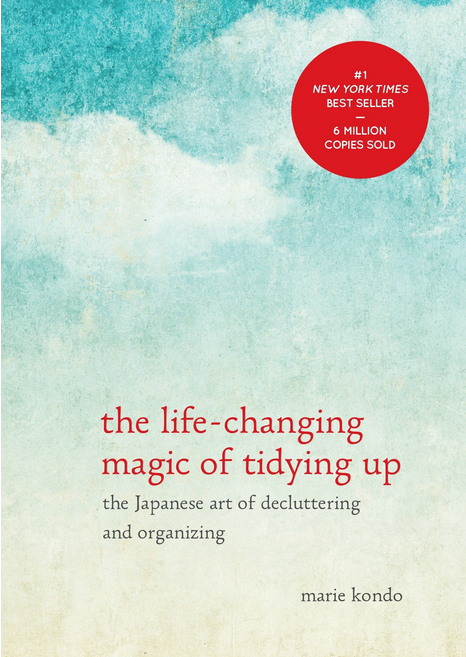 She is the Japanese organization guru who wrote the wildly successful book The Life Changing Magic of Tidying Up. She launched her home organizing business at age 19 and quickly built up an amazing business. She says that one of her customers gave her the idea to write a book for everyone who was on her months-long waiting list. The rest, as they say, is history! A friend actually gave me the book a few years ago but I have yet to apply it to my own life. It’s time! New Year’s Resolution #1. So, what is so special about the KonMari Method? Most people start organizing by rooms; Marie advocates organizing by categories; starting with clothes, then moving on to books, papers, komono (miscellaneous items), and finally sentimental items. The defining principle behind the KonMari method is the “does it spark joy?” question. The answer dictates what to keep and what to give or throw away. Mindful consideration of this question can reframe how we think about our material things. You can read more about how to implement Marie’s six rules by purchasing her book. Just click on the image to buy. There’s also a new Netflix series called Tidying Up with Marie Kondo and it’s already receiving lots of praise. In Tidying Up, Kondo assists families with tackling their cluttered spaces and dealing with the emotions that arise from letting go of precious mementos. Her unique method of handling clutter helps people get control of, and fall in love with their homes again. I have watched a few episodes and find it an effective and interesting process. It is not easy, but those who follow through find order and happiness at the other end. Just as great interior design can change someone’s life, so can organization! In the photos below, you will find some of my favorite organization ideas and products. One of my favorite places to shop for organization products is The Container Store. If you have not shopped in one of their stores, you are in for a treat. They have just about everything you will need to get your space tidy. I especially love their ELF Closet Systems. You can take any space, big or small, and create a storage area based on your needs. Use clear boxes for storage so you can see what is in the box. Again, use clear containers for kitchen items. Turn a closet into a gift wrapping station. Silverware drawer organizers are a must. Don't forget utilize the back of a door. 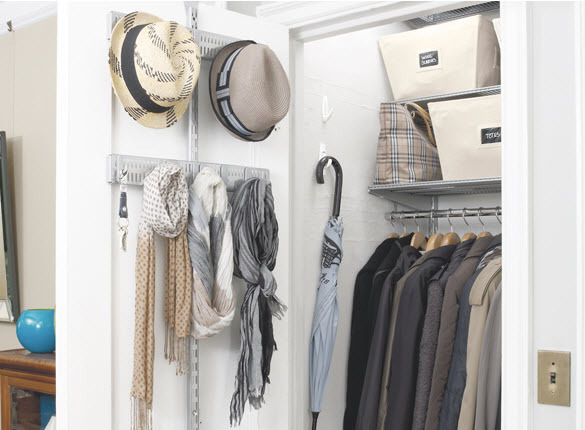 Portable shelving units are great for garages and basements. I live in a very small townhouse so being organized is of the utmost importance. I did some cleaning out of my closets over the snowy weekend. Here is a little show and tell. I ended up with five bags that I will be donating to Good Will. Here is my messy closet...stuffed. Here is my shoe and sweater area...yikes! All the clothes removed. Don't forget to vacuum and dust. It is a bit embarrassing when you see all the clothes piled up. Organized with room to breath! I had no idea I had so many shoes I was not wearing. How would you feel if your home were this tidy and organized? Join me and take control of your clutter and get organized! Let’s make this year count and do it together. I wish you luck and invite you to post on this blog and share your “tidying up” experience with my readers.